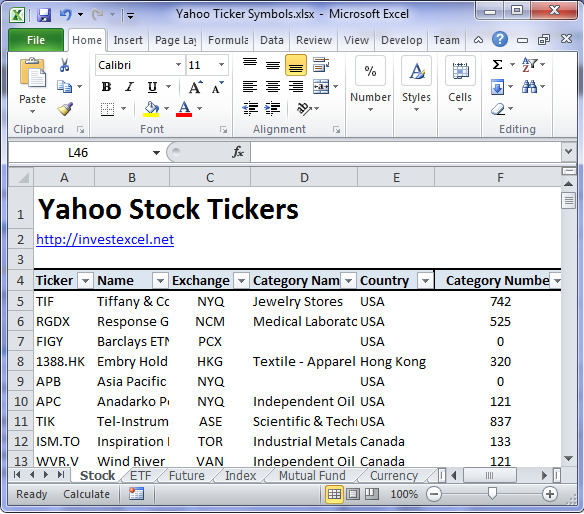 Get the complete list of Yahoo stock ticker symbols in an Excel spreadsheet – over 158000 ticker symbols for stocks, ETFs, mutual funds, warrants and more, across many international exchanges. You can use this list for stock screening, downloading bulk stock quotes, researching company financial information and more. It’s a fantastic resource that is difficult to find elsewhere (certainly not on Yahoo’s website). That’s 245784 tickers symbols in total. Once you have the entire set of Yahoo ticker symbols, you can use the symbol of your choice in your Techsignal analysis work.